The UMBC community gathered to celebrate the hard work, perseverance, and achievement of more than 1,200 new alumni at the Winter 2016 Graduate and Undergraduate Commencement Ceremonies, held December 21 and 22, 2016, in the Retriever Activity Center. 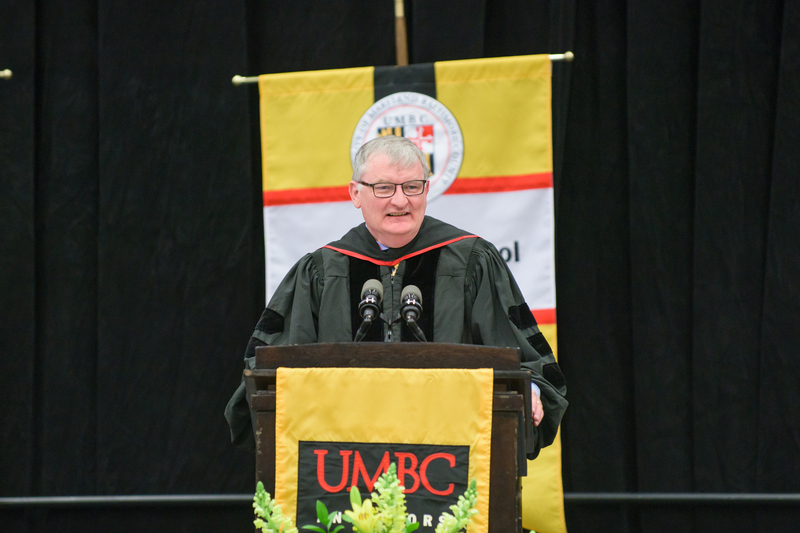 Both ceremonies included UMBC faculty, staff, student, and alumni leaders, as well as a representative of the University System of Maryland Board of Regents, and crowds of cheering family and friends. True Grit outside of the RAC. The graduate ceremony honored nearly 125 new master’s and Ph.D. degree recipients, as well as 80 graduate students who earned their degrees in August. Joining President Freeman Hrabowski, Provost Philip Rous, and Graduate School Dean Janet Rutledge in presenting remarks was Deanna Cerquetti, Ph.D. student in Language, Literacy, and Culture, and president of the Graduate Student Association. 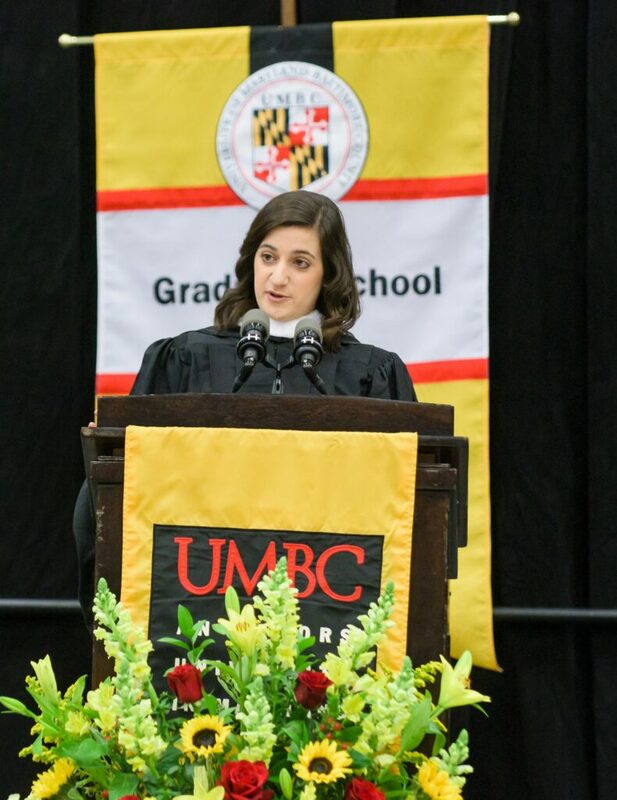 GSA President Deanna Cerquetti at Winter Commencement 2016. I think that remembering your own strength and resilience is a key part of being able to accomplish what you want to accomplish. […] We know that the world is in need of creative, resilient people who are ready to work on the many issues that plague our society today. We also know that you will leave here very equipped to handle those issues. Provost Rous at Winter Commencement 2016. 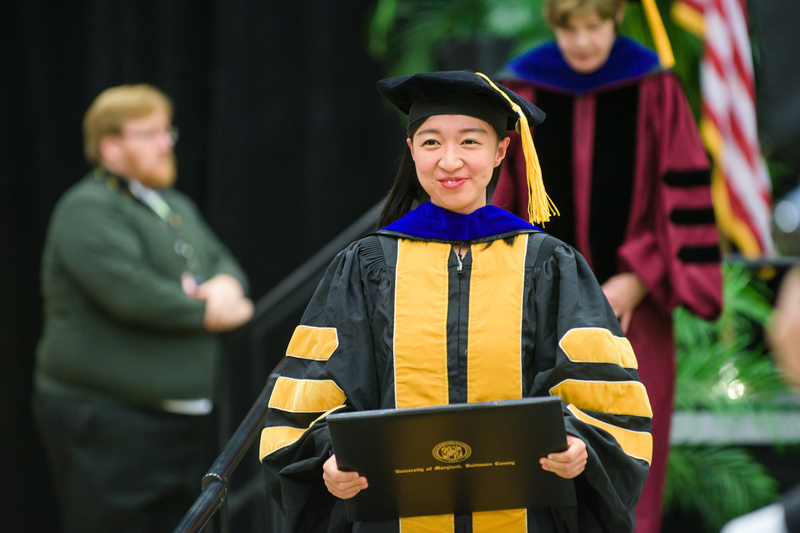 Jing Xu receives a Ph.D. in gerontology. The undergraduate ceremony recognized over 1,000 new bachelor’s degree recipients, including more than 800 earning their degrees in December and over 200 who completed their programs in the summer. Like the graduate ceremony, undergraduate commencement also balanced celebration with a look at tackling challenges to come. Pres. 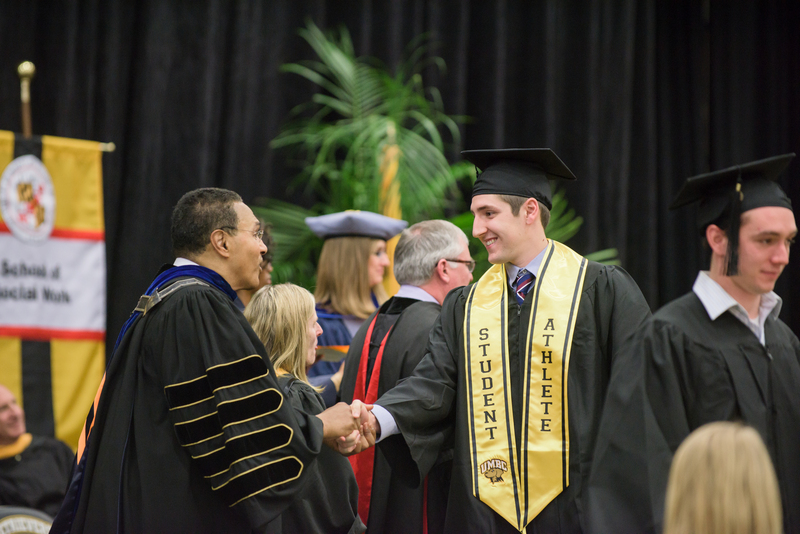 Hrabowski congratulates students during undergraduate commencement. Toward the start of his remarks, President Hrabowski emphasized, “The power of education is more important than ever in transforming lives,” and the commencement ceremonies were a celebration of that transformative power. Vice Provost Yvette Mozie-Ross ’88 and a student celebrate at the conclusion of undergraduate commencement. 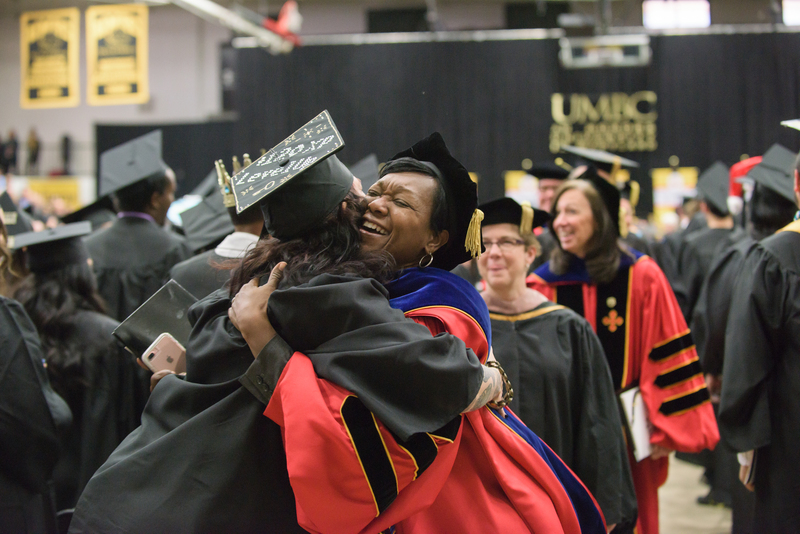 Videos of both ceremonies will be available soon on the UMBC Commencement website. 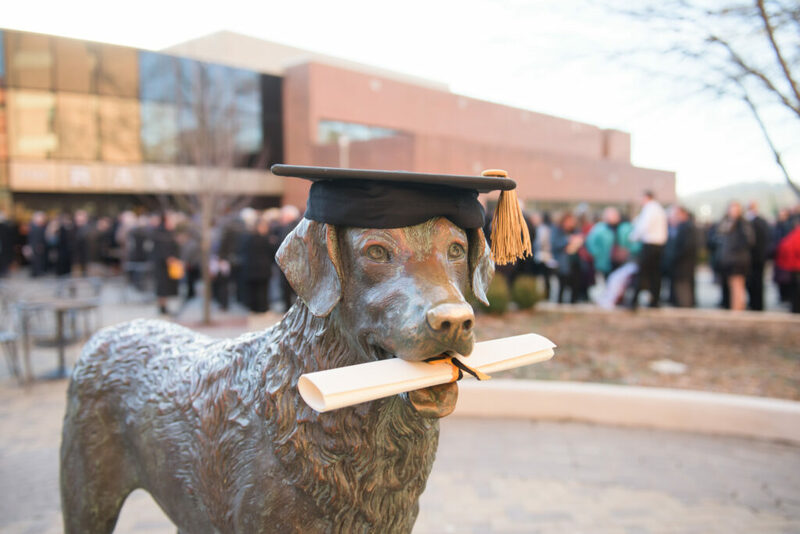 The ceremonies were also covered live via Twitter (@UMBC), Instagram (@UMBClife), and Snapchat (@UMBC), with students and families sharing their own memories through #UMBC and #UMBCgrad. For additional photos, see our Undergraduate and Graduate Commencement galleries on Facebook.